Longwood students, faculty and staff may access the Library’s restricted subscription database services from off campus using any commercial Internet service provider (ISP). Off-campus access to restricted resources is limited to current Longwood students, faculty, staff, and affiliates. When you attempt to access a Library database, you will be directed to a blue login page. 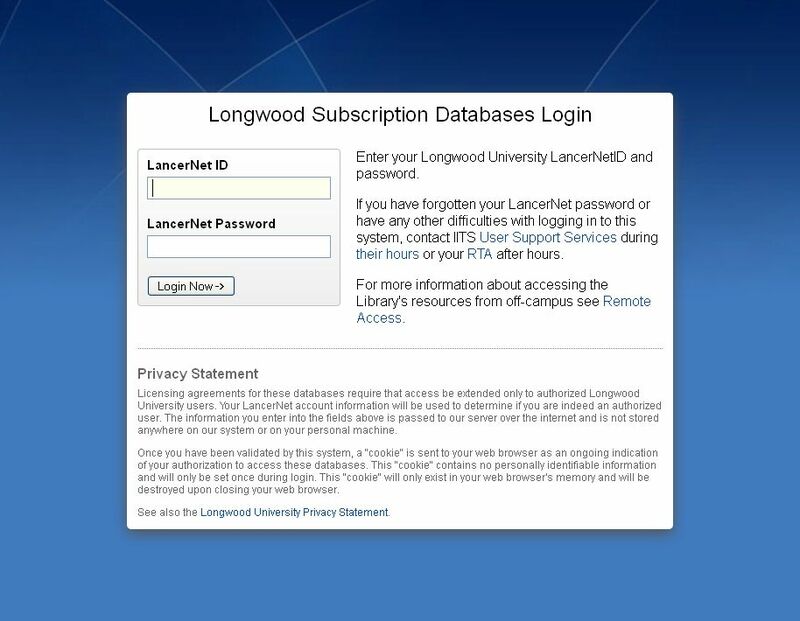 Enter your LancerNet ID and Password and click the “Login Now” button. For some browsers, you may be prompted about proceeding with a secure connection. If so, please indicate that you do want to proceed. Once you are validated, you may move between restricted databases without interruption. Your session will remain active for one hour or until you next start your web browser. Please direct questions concerning connecting and IDs /passwords for this service, including receiving a “Bad Username or Password” status error, to the User Support Services Help Desk at 434.395.4357. For questions regarding how to search a database, please ask a librarian. Are you a distance ed student? You are if you are a student currently enrolled in Longwood University, taking off-campus or online courses, and living more than 20 miles from campus. If so, you may use a special toll-free number provided by your instructor to reach the above phone numbers.